A book is a complex product. It’s very hard for a reader to judge a book by its cover or even by flipping through a few pages. 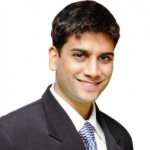 The default buying behavior is to buy based on recommendations. Most people buy based on recommendations from people they respect or people they perceive as having credibility. This includes journalists from their favorite newspapers and magazines, bloggers, other authors, their friends and even strangers whom they perceive as being unbiased in their opinions. . 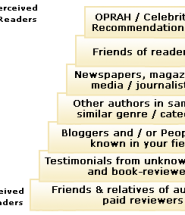 The picture below captures the hierarchy of value for endorsements and testimonials. The lowest boxes have the least value. The higher boxes have higher perceived value from readers. However bear in mind that this strategy of getting other authors from your genre to endorse your book can misfire if the other authors try to sell their work or make some “free” offer while seeming to praise your book. We’ve seen one case of this wherein an author began promoting their book with some 20 other “free” offers from other authors who were also praising this book. The whole campaign had “hucksters” written all over it and went nowhere. 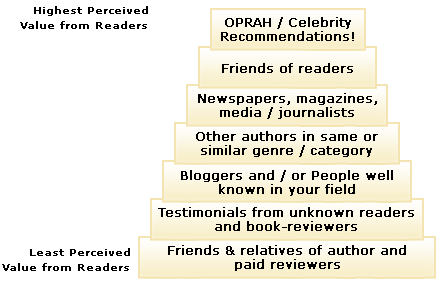 Ideally you need to network like crazy and get your endorsements before your book comes out. In this way your book will have the endorsements and testimonials as part of the book itself. If this is not possible, you should at least work on getting recommendations from influencers and mavens after your book comes out by reaching out to them. A common mistake is for authors to try and get a big name endorsement … but this does not work because big names endorsers are often unable to spend the time reviewing your book. Instead, concentrate on a small group of users who are very enthusiastic about your book. You should keep a conversation going with people who have read your book and have liked it. For celebrity endorsers simply send an email (or better still a hard-copy letter and copy of your book) and forget about it. Don’t get disheartened if you don’t hear back from celebrity endorsers. Think of it as a lottery ticket. If you win, you win big. But the probability of winning is rather low. Your chances go up if you meet with celebrities in person.